When you’ve spent thousands of pounds on a wedding you want to be able to enjoy it. Unfortunately, many women find themselves struggling to stand after only a couple of hours because their shoes are crippling them – not ideal when you’ve got to walk down the aisle, do the rounds of meet and greets, stand for hours taking photos and dance the night away. It’s hard work being a bride, and women need their wedding shoes to be as comfy as trainers but as stunning as their diamond ring. Now, unfortunately, we haven’t invented a super product that will make you feel like you’re walking on air but we have got some easy life hacks that might help avoid the blisters and make your feet the last of your worries on your big day. Please include attribution to https://www.shoezone.com/ with this graphic. There are various styles of shoe to choose from so while heels might sound daunting to begin with, don’t be dismissive. There are certain types of heels that offer comfort and convenience as well as style. Wedges have a platform heel that makes it easier to balance so if you know you struggle to wear stilettos but want to look a little taller on your big day, consider a wedged heel. You could also look at block heels, again these have a chunkier heel to provide you with more stability when walking. If the height of a heel isn’t an issue but you struggle to keep your shoes on your feet, don’t worry. A lot of people struggle with walking out of classic heels but styles such as slingbacks and sandals have straps as part of their design to help secure your feet. You should also consider whether your shoes are appropriate for your venue. If you’re having an outdoor wedding or you know you will be taking pictures on the lawn, white satin heels may not be the best choice. White satin stains easily so you may want to consider coloured shoes or different materials. Leather wipes clean fairly easily so if you do want to wear white shoes outdoors, any mud or dirt can be wiped off with some tissue in the toilets after. Consider your options and choose your shoe wisely. Try on different styles and see what feels right for you. Heels can be a bride’s worse fear. While the height advantage is great, when you’re not accustomed to wearing heels it can be worrisome. The last thing you want is to spend your wedding holding on to every table and wall while wincing in pain at every step. Your big day should be special and your shoes should be comfortable. There are flat shoe options, customised trainers are becoming increasingly common and ballet pumps have a classic design that make them just as elegant and stylish as heels. If you’re not comfortable with a heel at all don’t be afraid to consider flat options. At the end of the day it’s your wedding and you should be able to enjoy it. There are also various heel heights so if you’re worried about heels, try the different sizes and see if the smaller heels are manageable. High heels are 5-6 inches tall but kitchen heels are only 1-2 inches. Try on some shoes and see if the heels work for you. When shopping for shoes, there are a few things you should know. Throughout the day your feet swell so leave your shoe shopping until the end of the day. You can then ensure that your wedding shoes will still be comfortable at your evening reception. When selecting your shoes, you should also pay close attention to the fit and you should practice walking in them before making a purchase. Check the arch of your foot isn’t too elevated from the shoe, walking towards a mirror will help you realise this. If the angle of your feet looks odd, chances are your heels are too high for you. Always make sure you walk around the shop before buying shoes. Wear them for as long as you need and make sure they fit right and are manageable. If your shoes feel a little narrow, buy them a half size too big. Buying shoes that are too tight are one of the main reasons women find heels uncomfortable so why not try a slightly bigger shoe size. Opt for shoes that are a half-size bigger than your normal size, you can always adjust their fit by stuffing some cotton wool in the toes. If you’ve already bought your shoes and are still worried about your feet lasting all day, we have a few additional comfort hacks that really do work. Deodorant is a bride’s best friend and we don’t just mean using it to keep fresh. If your heels have straps spray them with deodorant. This will help soften them so when you wear them they won’t rub against your skin as much. You can also use roll on deodorant on the back of your heels to put a protective layer in between your foot and shoe, so if your shoes decide to rub you are less likely to develop blisters. You can also make use of accessories. Heel grips will stop you walking out of your shoes, fabric can be added around straps to stop them rubbing, insoles act as a cushion for your soles and heel stoppers prevent your shoes sinking into grass or mud. If you can’t find any shoes better than your trusted heels, why not consider customising your existing shoes to make them wedding day perfect. Here are some creative ideas for adding that special touch to make sure your wedding shoes are unique. Apply glitter nail varnish to heels to add sparkle. You could pick out a colour that matches your wedding theme or bridesmaids dresses for a bespoke look. Another great way to add sparkle is to embellish your shoes with glue on diamantes. It’s easier than you think, just use a good fabric glue and some Swarovski flat back crystals applied carefully with a pair of tweezers. You can add these around the trim or in a specific pattern on the shoe, once again making your shoes into something extra special that no other bride will be sporting on her big day. If you’ve got the fabric glue but sparkle’s not your thing, how about adding some lace from your dress to your shoes? If you’ve had dress alterations you may have some material left to use as a trim or even to cover the whole shoe. There’s no better way to ensure a perfect match! For a really personal touch, however, try embroidery. You could add initials, your wedding date, or your marital name to certain shoes in this way. This turns your shoes into a great keepsake with memories of your special day. But if all this sounds a bit too creative or time-consuming for you but you still want to add a custom touch to your shoes, try looking out for a beautiful hair clip or brooch that you love. Buy two and simply clip or pin to your shoes to add a special feature. 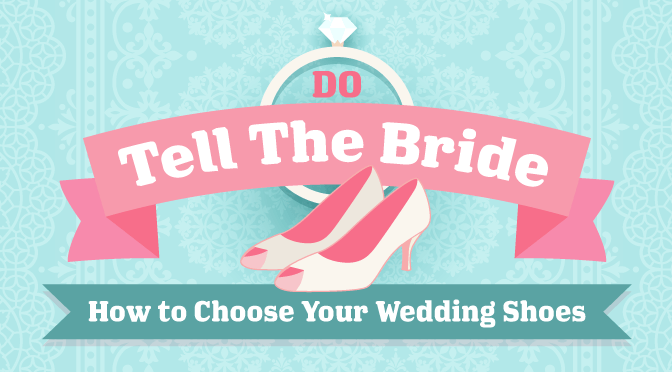 Try out any of the above so you can be assured that you won’t have seen another bride wearing identical shoes! When your special day is complete you’ll want to hold on to as many memories as possible. Your shoes can be a big part of that. Here are our top ideas for using your wedding shoes to help remember your day. Perhaps you don’t want to preserve your shoes forever, but you’d rather have the option to wear them again whilst thinking of your wedding day. Why not paint your heels so they are a more versatile style option to wear again? Different types of paint or dye are suitable for different materials, but this should be possible for most shoes. Alternatively, you could save them and only wear on special occasions. Some brides like to keep them for big events like anniversaries and christenings. Many brides love to create a memory box that they can open up from time to time to help the memories come flooding back. It’s simple to do, just fill a box with memorable items from your big day. Personalised shoes would make great additions. If you want to go one step further you could even display them on your dresser. Get a glass bell jar and place the shoes inside so you can enjoy looking at them every day. For either of the above they might need a good clean first, so check out our guide on how to clean women’s shoes. Finally, if you’re not the sentimental type you could always sell them and pass them on to another bride. If you’ve only worn them once they might have plenty of life left, and another bride on a budget might find them just right. You’ll be able to enjoy the fact that someone else will get to spend a day as happy as yours wearing them and if the wedding day has left you strapped for cash selling on some of your items is a great way to recoup a little of the cost. Finding that perfect match is important. Your wedding is your special day and you deserve to enjoy it. Take your time choosing your shoes and consider all of your options. Don’t be scared to look at alternate styles, it’s your day and your choice. There’s also several things you can do with your shoes after purchase to make them a little bit more comfortable for all day wear. Try adding accessories for maximum wow-factor, but most of all, enjoy your special day! How to Style: Navy Court Shoes!